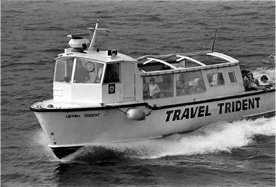 Trident Charter Company Limited, established in 1968 started operating a ferry service to Herm Island during the summer of 1969. Safe, clean, pollution free, no cars, no crowds, no stress. Travel Trident offer the official running service to Herm Island 364 days a year and has operated the service since 1969. Travel in safety and comfort enjoying the sun deck on typical summer days. Special charters and other functions by arrangement.